Today we welcome SCBWI Germany & Austria member Amber Lough whose second book THE BLIND WISH (Random House Children's Books) was released last month. Welcome Amber! Tell us a bit about yourself. Where you're from, how you started writing and how long you've been writing with the goal of being published. I’m from all over, so I never know how to answer that. I moved every two or three years, often from country to country, and it either cultivated or warped me, depending on how you look at it. I was in second grade, in Maine, when I decided I wanted to be a writer. It was never my only goal, but it was the most constant. In High School I went to a special summer camp in South Carolina for artists (SC Governor’s Academy), and focused on creative writing. That really got the ball rolling. Tell us about THE BLIND WISH. What was it about this series (The Jinni Wars) that drew you in and kept you writing? 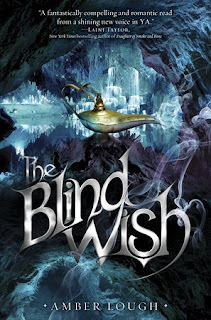 THE BLIND WISH is the sequel to THE FIRE WISH, and without giving too much of the first book away, I can say that it is about jinn and humans, families, war, secrets, and redemption. I’m always drawn in to stories about characters in difficult situations, but I need a bit of magic or mystery to keep me in the story. I chose this setting because I lived in the Middle East when I was the most desperate for more to read. I was 13 and 14, and wanted a story like this, but there wasn’t anything I could find. I was stuck with euro-centric fantasy if I wanted anything at all. Could you share some of your process for writing this series? Was it all plotted out in advance? How long do you need to create a first draft? How long was your revision process? It was like finding my way in a dark labyrinth. I knew where I wanted to end up, but I wasn’t sure how to get there and I wrote so many, many drafts that didn’t make sense. I also wasn’t planning on writing a series, so I had it all wrapped up at the end of the first book. When I was asked to continue it, I had to come up with something fresh. That time, I plotted it just a wee bit more. As far as revisions go, I revised THE BLIND WISH at least three times. The first time was as I went, with help from my CP. The other times were with my agent and editor, and they go pretty deep into plot. Once we got the storyline set, then we got out the finer instruments and worked on word choice, pacing, etc. To be honest, I don’t remember how many times we revised! I've read part of your success you grant to being a SCBWI member. How did being a member help you become published and/or getting an agent? Yes, and it was wonderful! I was runner-up in the SCBWI Work-in-Progress Grant in 2007 (Ruta Sepetis won first place that year). It was for a historical YA that is not published, but it certainly helped me get an agent. Or, at least, helped my query rise out of the slush. It also helped me emotionally, because it was a sign that I wasn’t so terrible a writer (which I still struggle with now, sometimes). I can never thank SCBWI enough for that! What was the biggest challenge you faced in the editing process with your editor? The first editor letter was as difficult to read as it was exciting. She asked me to add about 20K words, mostly backstory. I have this problem in that I underwrite and need to go back in and explain things or draw out scenes so they have greater emotional impact. Those 20K words ended up being Zayele’s first three or four chapters and the bits later on with the memory crystals. Your first book was published while you still lived in the US, this second one while you are here in Germany. I know it must be hard not living in the country where your book is being published. Do you have any advice for authors who may find themselves in the same situation? It is hard. I can’t go to my local store or library and see my book on the shelf, and I am very isolated from other writers, unless I hop on the train and go for a few hours. If it weren’t for Twitter, I would feel utterly cut off from the writing community! I think it’s important to keep in contact with libraries in the country your book is sold, as well as try to set up Skype sessions with classrooms, if you can. I’m still trying to figure it all out. This is my favorite topic, always. Right now I’m working on another historical YA, but this time it focuses on the eastern front of WWI, mostly in Petrograd. This book is a feminist war novel on the surface, but if you dig a little deeper, it’s about friendship, courage, and sacrifice. I have a degree in Russian Studies, and I’m so happy I finally get to use some of what I learned! One lucky winner will be chosen randomly and announced on Sept 24, 2015. Good luck everyone! Two sisters. A war. And the wish to end regret. . . . The magical, evocative follow-up to The Fire Wish. The war: The lies that started the conflict are in the open now, but the war between the humans and the jinn is as bitter as ever—and becoming far more treacherous. The sisters: Najwa and Zayele have just learned they’re half-jinni, half-human twins. Najwa is now the jinni representative at the human palace, working to bring peace. But her new role comes at a price—she’s no longer allowed alone with her cherished Prince Kamal. And as Zayele adjusts to life among the jinn, she discovers that she’s a magus, one of the most powerful jinn in the Cavern. Suddenly, she’s thrown into special training, and the strongest young men in the army are competing to be paired up with her. The wish: Once again, Zayele makes a wish. A wish that she doesn’t think can possibly go wrong. A wish that neither sister could imagine would change the outcome of the war. Amber Lough lives with her physicist husband and their two kids in Lower Saxony, Germany. As a child, Amber moved about every two years and spent much of it overseas in Cuba, Japan, and Bahrain. She attended High School in North Charleston, South Carolina and studied Russian at Saint Louis University in Missouri before heading into the Air Force. She was an Intelligence Officer stationed in San Diego, and travelled the Pacific for her job. She also spent about 8 months in Baghdad, Iraq. After having her first child, she left the Air Force to begin writing full-time. Visit Amber over at The Fourteenery and The Hanging Gardens where she contributes with other YA authors. Great interview, and I'm so glad I met Amber and other writers on Twitter too! I'd love to win this book! Oh so timely...I just started THE FIRE WISH and only put it down to check my emails. Nice to know I won't have to wait for the sequel. Wishing a gazillion sales for you Amber!